It was the 13th December 2011. I was sitting at my computer, in my new house. 10 days earlier we had moved 2000km south. Life held so many possibilities: new school community, new friends, Winters spent skiing together as a family, Summers spent at the coast with my sister and her family, lots of camping etc. We had spent the previous week unpacking, and the kids were getting bored. Steve came upstairs to suggest we take the kids riding at Stromlo (another of the draw cards for moving to Canberra). I can still remember so clearly thinking I didn’t want to go. I wanted to catch up on work. Then I remembered the promise I had made to myself – work was to take a backseat to spending time being active with Steve and the kids. I was going to get fit. So off we went. We had a lovely family ride through some of Stromlo’s beautiful tracks. Before heading home we decided to spend 10 minutes at “The Playground” – a section of the famous mountain bike park set up with balance bars, teeter-totters and the like. We decided to play on quite a steep ramp that swerved around to the left at the bottom. I made it the first time. On the second my brakes weren’t working well enough – I was going too fast to follow the track around to the left. So over the lip I went and as my front tyre found a log, the bike stopped and I was thrown over the handlebars. I started to scream as I sailed through the air. When I hit the ground the air was forced from my lungs causing a muffled scream to continue. I was aware that I was making the most awful sound, something of a wounded animal, but I had no control. It only stopped as my lungs become empty. Will was the first to run down to me. He carefully removed the bike from on top of me. Steve and the other kids were soon by my side. Fraser burst in to tears at the sight of me. I remember struggling to remove my helmet as the strap under my chin made me feel like I was choking. Steve removed my helmet and slowly sat me up. I had a badly grazed arm and side and pain in my ribs, neck and back. I had slightly blurry vision and the only sign that I had hit my head was a tiny graze on my forehead. After a rest I felt that I was up to slowly making my way back to the car. We had taken 2 cars. I felt sore enough that I dreaded the idea of having to come back for the other car – and ok enough to drive home. 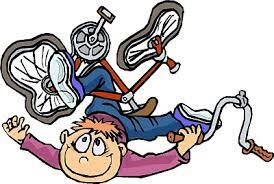 How many people do you know that have had similar falls off bikes? Yes I was a bit sore, but I had to expect that. I was a little dizzy from time to time but surely I was a little concussed. I woke up the next day feeling like I had fallen off a bike. I was sore and stiff. I have never been one to see doctors. Anything I had ever had went away on it’s own. Later that day I called my husband and told him that I just wasn’t feeling right. So a CT scan of my neck and head was arranged. My CT was all clear. Relief! I was still managing to work, look after my 4 kids, drive and cook dinner. Surely I was fine. People fall off bikes everyday……. don’t they? September 30, 2013 in My Stroke Journey. Oh Steph, I can just picture you as you write about that day. You already have a great skill with your writing, so proud of you. Keep it coming my dear.